I have missed out on this autumn’s conference circuit. I just don’t have the money to pay for fees and travel (let alone beer) in attending these events. I am not sure that I actually miss the conferences themselves, but I do miss meeting friends and catching up with what is going on. And of course, it is increasingly possible to at least dip in to conferences online these days. What with mobile phones and twitter you can almost watch the slides progressing in real time. This morning I noticed one presentation seemed to be getting a lot of my twitter feed. 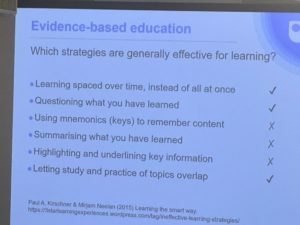 It was Mike Sharples speaking at the ALTALC tagged conference – it took me some time to suss out the ALC stood for the Active Learning Conference taking place at Anglia Ruskin University. 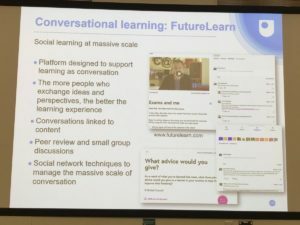 A couple of slides interested me.The slide above is based on the Open University FutureLearn platform. This sums up perfectly how we have used the platform in the EmployID project for running (sadly not open) courses on the Future of Work for employees from the UK Department for Works and Pensions (the UK Public Employment Service. The evaluation showed the courses to be a great success (more on this tomorrow). But I am not so convinced to what degree the FutureLearn platform helped our pedagogic approach – at best I would say it hindered us less than other MOOC platforms we have used. The second slide also rings true – at least to my experience in using technology for professional development. It is not always easy to link online professional development to practice. But I am ever more sure this is critical to effective learning. Learning spaced over time is an interesting idea in an age of quick bite learning. Of course it depends learning over how much time. Ideally the learning should evolve in line with the practice – but that is not easy to achieve. This entry was posted on Tuesday, September 12th, 2017 at 18:38	and is filed under Communities of Practice, e-learning 2.0, Employ-ID, MOOCs, online communities, online learning, open education, Pedagogy, teaching and learning, Wales Wide Web. You can follow any responses to this entry through the RSS 2.0 feed. Both comments and pings are currently closed.